Housekeeper Liu isn’t all he seems to be. Of course, none of Tong Hua’s characters ever are what they say or seem to be at the first glance. Housekeeper Liu (full name Liu Wen Zhao) is the cousin of Jin Yuan Bao. Jin Yuan Bao is a bit of a prick and is pretty douche-y when it comes to dealing with his cousin, dismissing him and treating him like a servant. Liu Wen Zhao and his sister Liu Qian Qian live in Jin Yuan Bao’s house. Liu Qian Qian has always assumed that she was going to be Jin Yuan Bao’s wife. Not some Lady of the Jiang’s house. He meets with another guard in the house and they go to a bamboo forest. They talk about the arrest of Chu Chu, who has been helping them with selling the girls. The beggar turns out to be a girl. She is bent on seeing the birthmark on Jin Yuan Bao’s body, so she and her friends dress as dancers to try and sneak in during the celebrations. Only to be turned away. The girl decides to try a different way instead. Jin Yuan Bao’s mother takes Jin Yuan Bao to the ancestor’s room and tells him to kneel to the family before him. She asks if he really refuses to marry, he says he can’t do something that goes against his principles. She tells him to stand up and she kneels in front of him. She explains that the future of dynastic succession rests upon this marriage. The eldest prince, who is good and gentle is threatened by his power hungry little brother. Jin family controls all the weaponry distribution while the Jiang family has great governing power. The Grand Dowager doesn’t want familial strife caused between the war between two brothers, so she suggested this union to scare the younger brother into submission. The Grand Dowager knows that if the Jin and Jiang families had this union and were loyal to the Eldest Prince, the younger brother would not be able to keep making trouble. Jin Yuan Bao’s mother cries and begs her son. Jin Yuan Bao says that dynastic sucession wouldn’t just be solved with something like one marriage. If they give him time, he will find the evidence of the Second Prince’s plans for rebellion But Mama Jin says that had there been time, the Empress Dowager wouldn’t have come up with such a plot. Jin Yuan Bao can not enjoy all the power of his position without sacrifices. She has let him do everything he wants, including becoming a detective for the government, can he do this for the sake of the nation? He couldn’t bear see his mother cry and bitterly agrees. A mysterious figure comes to meet Housekeeper Liu, it’s the second prince who has been the leader of the girls’ smuggling ring the whole time. He tells Housekeeper Liu to find and kill Chu Chu who now is more useful dead than alive. And then he tells Housekeeper Liu to kill Jin Yuan Bao’s fiance Jiang Xiao Xuan, to put a kabosh on the whole Jin and Jiang marriage/merger. Housekeeper Liu looks troubled. Meanwhile Jiang Xiao Xuan is trying to plan her escape, but gets interrupted by her maid who forces her to take a bath. Jiang Xiao Xuan tries to pushes her maid away, but can’t get rid of her maid. The Girl (played by Tang Yang, no name yet) decides to sneak into the bridal party and then into Jin Yuan Bao’s house at the wedding. Jin Yuan Bao quips, “Nonsense, you wouldn’t find a more perfect body like mine in the capital” but his weight provides to be too much for the servant and Jin Yuan Bao gets dumped into some dirty bags by the wall. He stands up and pushes the servants away saying he’ll just try himself. A hilarious sequence shows Jin Yuan Bao trying to climb the wall like a desperate dog and falling each time into the dirty pile of bags. The Servant tries to provide a hand, but ends up just throwing Jin Yuan Bao into the pile of dirty bags, over and over again. At one point, it just looks like Jin Yuan Bao is thowing himself at the bags instead of the wall. He coughs exhaustedly as he lays in a dirty heap on the bags. The Girl easily flies into the inn where Lady Jiang is staying. She glides over the roofs and try to find the lady’s residence. Meanwhile the servant has found a doggy door and shows it to Jin Yuan Bao. Since doggy doors are a pretty insulting way to enter someone’s house, I’m nearly crying with tears at this point. The servant tries the door first, and gets stuck, all the while Jin Yuan Bao is kicking his but and telling him to go faster. He says he can’t and Jin Yuan Bao pulls him out in annoyance. Meanwhile the girl has found Jiang Xiao Xuan and her maid. Jiang Xiao Xuan is in love with someone named Li. Her maid chides her that if Master Li hasn’t tried to contact her, then it means he’s not interested. Jiang Xiao Xuan says that Master Li is studious and probably hasn’t heard about the news. The servant chides her and says that the entire capital knew of the news Master Li would have heard. The Girl loses her balance on the roof in alarm from the scream and falls through the roof into Jiang Xiao Xuan’s tub. The Girl shows Jiang Xiao Xuan that she’s a girl also and the two girls gets dressed. The Girl casually grabs some of Jiang Xiao Xuan’s clothes. Jiang Xiao Xuan realizes that all the soliders when to go search for the intruder and she now has a small window to escape. She does so and leaves The Girl in her room. The housekeeper realises that someone powerful was in Jiang Xiao Xuan’s rooms and takes his men to go check. The maid comes back and realizes that her Mistress is gone, that she’s dead if the marriage doesn’t go as planned. They fool the housekeeper Liu but the maid is now worried that they have no way to get past tomorrow. The Girl shrugs, unfazed, saying that they will cross that bridge when they get there. The Girl decides that she’s going to be faking as the Bride. She and the servant will escape in the confusion. Chu Chu shows up in Housekeeper Liu’s room. She did have anywhere to go and she says that in her deals with him, she realises that he’s different from the evil people. He’s not like them, and he probably has his own reasons for doing the things that he does. Housekeeper Jin tells her to rest here, that he will get her out. But then he hits her and she faints. The housekeeper isn in the Jin residence and his man asks why will they do now that Lady Jiang is still alive. Housekeeper Liu smiles and says that as long as the Bride is ruined the marriage can’t go through. He orders his men to prepare some fireworks so as to destroy the bride’s face tomorrow. Housekeeper Jin gives a hairpin covered in blood, and tells the man to tell the 2nd prince that Chu CHu is dead. Chu Chu wakes up in a carriage and realizes that the housekeeper was as good as his word, he got her out of the capital and gave her a wad of money. Jin Yuan Bao looks like he’s about to face his execution rather than his wedding. But once the bride arrives, the firecrackers go crazy, according to Housekeeper Liu’s plans. Jin Yuan Bao grabs the bride and they do the whole romantic spin. Except once it’s over, he pushes out of his arms and into Housekeeper Liu’s arms and walks away. People come to make sure the Bride is alright. Instead of Jiang Xiao Xuan, it’s actually the Girl. She complains that she’s hungry and the maid hushes her. They walk inside. So I don’t even. There was a point where I laughed so hard that I think my neighbors heard me. Wallace Huo only gets better and better as the episodes goes on. The wall scaling bit was as funny the first time as the second time I watched it to recap. That boy’s facial expression kills me all the time. His costumes, along with everyone else’s in this drama is gorgeous and thankfully, muted. One thing I can’t get over is how terrible some clothes are in dramas, it’s almost like trying to eat a perfectly made sunday only to discover the syrup is actually ketchup and there are bits of dirt flecked everywhere. Sorry for that gross picture. Anyways, Jin Yuan Bao is a pretty big prick with a strong moral compass. As for housekeeper Liu, for the two episodes I’ve seen him in, I’m still not quite sure if he’s a good guy or a bad guy. This is why Tong Hua is awesome, she keeps each character complex without overdoing it. Also, how awesome is Tang Yang’s character? Cool under pressure, brash but not crass, feisty without being the whiney kind of heroine that sounds more like a broken tape recorder than actual human being. This is such a good show. I’m really glad for this show, because for all its flaws, it’s a lighthearted show best for watching after a long day at work. I tried BBJQ but have decided to drop the show from ep 9 onwards. The plot is confusing, the tone of the show too dark for my current mood, and it’s a disappointment how the script didn’t reach into the library of conflicts that could have resulted from Zhang Xiao coming back to the present with her memories of time travel intact and meeting Yin Zheng with all memories of past life gone. I understand that the time travel theme has been clamped down by authorities, but it is such a waste! So instead, I’m gonna spend my little available free time on Perfect Couple. Writing is quite uneven in the first few episodes and I was surprised initially because I had expectations for Tong Hua…I wouldn’t have been so picky, but because the writer is TONG HUA (!) so I had inevitably raised my bar a bit. For example, the one where Yuan Bao as trying to scale the wall..erm, there was a wheelbarrow right there next to the wall, which I thought would have given him a metre’s advantage if he climbed on it. There were also illogic parts such as *SPOILER FOR EPISODE 4-ish* Yuan Bao jumped into a lake to save Qi Lin, and ended up struggling to stay afloat himself. 1) The cousin was shouting so loudly for help, yet for the mightly Jin household, no servant held her and came to help except for Yuan Bao and Chang Feng. 2) Qi Lin jumped into the lake on the other side of the boat instead of running to the side where Yuan Bao was drowning before jumping in, hence wasting precious time. And also the part when *SPOILER FOR EPISODED 6-ish* Housekeeper Liu didn’t recognise Qi Lin as the person he fought at the inn; he had to infer this fact subsequently when someone told him that “Xia Xuan” knows martial arts. Then the *SPOILER FOR EPISODE 8-ish* part where Yuan Bao and Qi Lin fell into a trap (?) in the forest. Yuan Bao flooded the hole with water from a underground source, and they ‘foated’/’climbed’ out with the water level; Yuan Bao can’t swim so I don’t know how he survived treading water for so long a period. Thankfully, the pace and logic picked up quickly. At least, the chemistry is there and the comedy is fortunately at the right degree, unlike what stills initially suggested. 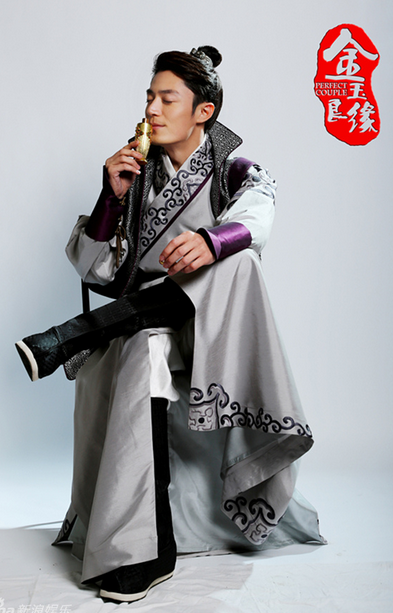 Jin Yuan Bao’s character is just like his name suggests…foolish. XD It’s so hilarious to see him genuinely think so highly of himself, when we the audience can see that he is really just a Fu Er Dai (though a kindhearted one, of course) who has his taste spoilt by wealth, and people to help him out of trouble (such as his bodyguards/constable sidekicks when he’s threatened by skilled criminals during his crime investigations). Glad that Tong Hua create this character, instead of the typical 风度翩翩 but icy male lead. I found myself skipping a lot of the scenes between Xue Er (the real Xiao Xuan) and Chang Feng, but they do make a cute couple, just that I am more interested in the main OTP! Housekeeper Liu is also an interesting character *SPOILER FOR EPISODE 8-ish*, asking his men not to hurt Qi Lin, in spite of having suggested the plot to burn her face on the wedding day. He even purposely let off Qi Lin and Yuan Bao by asking his men to chase in the wrong direction. I hope he is a complex character, and the above instances are not due to lazy writing.